Take your humidity molecules and mix with the Coronado Spring. They will combine to become as hot as possible. Move into your hotel room and be thankful for the conditioned air. Assess your pancreas. Salute your pancreas if it functions properly and don your orange bracelet with pride. 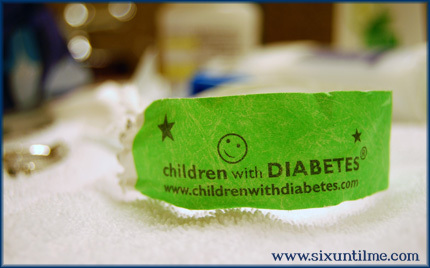 If your pancreas is a thumbs down as far as insulin production goes, put on your green bracelet with pride as you are not alone with diabetes. Attend focus groups and meet with companies who aim to make a difference in the lives of people with diabetes. Between meetings, visit the pool and go down the waterslide, mingle with CWD staff and friends at Pepper Market, and give a happy wave to strangers-who-are-not-strangers. Have fun. Enjoy healthy meal options that are carb counted (and gluten-free if that’s your jam). Dance with the DJ at the banquet. Meet the Disney characters at breakfast. Get a retinal screening. Learn about things like diabetes and exercise, and going to college with type 1 diabetes, and new technology options, and parenting and pregnancy. Collect at the social spots in the evenings and talk about LIFE and some diabetes but not entirely diabetes. Be thankful that companies and sponsors and donors have come together to make an event like Friends for Life possible. Thank them for their financial contributions and support. Thank the fellows. Thank the scholarship programs. Thank the staff for their tireless efforts. Thank your friends and families for being part of this experience with you. Rinse and repeat for several days, until your heart is full and your voice is gone and the corners of your mouth feel stretched to the brink from smiling. Disclosure: I could not be prouder to be a member of this organization as a board member, part of the adults with type 1 diabetes faculty, and a grateful PWD attendee. My travel and lodging are covered by the organization, but my opinions and dedication to the cause are my own. Huge thanks to the staff, supporters, and sponsors who make Friends for Life possible. If you’d like to make a donation to support CWD, please click here. My Little Orange Bracelet. Friends for Life Frenzy. Flick of the Wrist. Perspectives on Diabetes: Why Children with Diabetes Matters. Don’t forget the Mickey Bars! They make your FFL experience that much sweeter! I have a companion recipe that involves after-hours and the bar!!! Love this. Delicious moments shared. It was a treat to meet [edited by Kerri] Birdy! A living doll. Thank you for all you do for the t1d community. Our lodging and what nots are not covered but our opinions are exactly the same. 2 Orange parents, a 13 & 16 yr old orange and our green 14 year old truly have made FFLs and we have already started the count down to 2018… 362 days and 11 hours! Beyond Disney magic. I’ve only made this once, but it was the best recipe ever! SO glad u had another great experience at FFL!!!! I just want to take a minute to invite u to another great gathering of like minded D folks. September 9, 2017 Dr Stephen Ponder is coming to Braintree, MA (although it’s being advertised as a Boston event) to present a workshop on “Sugar Surfing”. I’d LOVE LOVE LOVE for you to come if your able!!! !